​Stay tuned for this month’s NJSEA spotlight, Megan Namnama, who serves as a member of the NEA Advisory Committee, NJSEA Political Action Chair, and the Founding President of NJSEA at Montclair State University. Within this past month, Namnama has declared her candidacy for NEA Student Program Chairperson. Come summer, she will attend the NEA Summer Leadership Conference in Washington D.C. as a member of the NEA Advisory Committee, a representative of NJSEA, and a candidate for the Chairperson position. If elected, she will represent thousands of pre-service educators across the country for two years. Read below for more on what Namnama’s NJSEA colleagues have to say regarding this new prospect, and stay tuned for the interview. I want to teach because I had wonderful teachers throughout my educational career. I want to give back, as my teachers did. I want to help my future students to achieve their dreams. I am involved in the union because it is a way to further my education on how to be an effective teacher. I am able to meet new people and learn about other people’s experiences. One of the main reasons for wanting to teach is the incredible feeling of taking a leap of faith in others as you teach and grow with them. I always knew that I wanted to help people become better and lead them to success. However, teaching was never on my list. At first I was too focused on the salary instead of the passion and love of doing a job. It was difficult and at times frightening for me to want to go into education. I never saw it as an option, because I was too busy thinking about the monetary worth of teaching. Fortunately, I had my sister and many other supporters help me realize that I would be working for a long time and that I should pick something that I loved to do no matter the income. That’s when the spark went off and I could think of no better job than to teach. I didn’t realize this before, but I have the ability to empathize with people and build a deep connection with them, which to me is important when it comes to teaching. I enjoy helping others understand whatever they are struggling with and see that “aha” moment. What’s more, I want to be a teacher leader and learn to work with my coworkers to improve the school system and learn from my students. I want to challenge people to do better, and be better. I know that I will make a positive change in this field. Whether this is to many students or just one, I have no doubt that that there will be growth involved. Around the holiday season, on every social media platform you see people discussing why they are thankful for all of the wonderful things they have in their lives. NJSEA is something that I am very thankful for, and I’m going to tell you why. 1. Professional Development Opportunities – As a pre-service educator, you constantly hear from current educators talking about the amount of PD hours they need. As a member of NJSEA, I have been able to attend so many different workshops, from events hosted by the chapter on my campus, events held by NJSEA, workshops held by many of the county associations, the NJSEA Educational Leadership Matters Conference, and, my personal favorite, the NJEA Convention in Atlantic City. Attending these workshops supplement what I am not learning in the classroom, and helps me learn more about topics that I am interested in, such as Dyslexia and Autism Spectrum Disorder (specifically Asperger’s Syndrome). 2. Leadership Opportunities – NJSEA’s motto is Educational Leadership Matters. This motto is truly brought to life by the NJSEA Leadership team. As one of the many state ambassadors, I have had the privilege of working with the wonderful and dedicated pre-service educators on this team, and I have learned so much about the qualities of a good leader. In turn, I have also learned even more about myself as a leader. 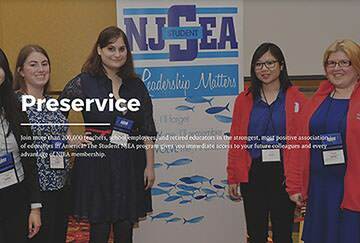 One of the best things about NJSEA Leadership is that there are not only state level leadership opportunities, but that these prospects are also available on a campus level, as well as a national level, so there is something for everyone’s interests and schedules. 3. Traveling Opportunities – The past two summers I have been fortunate enough to be chosen to help represent NJSEA at the Summer Leadership Conference for the NEA-SP in Denver, Colorado (Summer 2014) and Orlando, Florida (Summer 2015). This may sound corny, but it is completely true: attending these conferences has been life changing. Not only have I learned so much about my future profession of choice, but I have been given the chance to meet other passionate pre-service educators from all around the country – even Hawaii! Attending these conferences opened my eyes to how powerful NEA is, and how large the profession of teaching is! An added bonus of getting to attend these conferences was the opportunity to explore a new place (Denver) and play tour guide while in my favorite place on earth, Walt Disney World (Orlando)! 4. Service Opportunities – Through NJSEA, I have been able to volunteer with some very deserving groups. While at the Summer Leadership Conference, an entire day is dedicated to service. In Denver, Colorado the day was called “Outreach to Teach,” a program in which the NEA student program works with retired educators and goes to a school and completely “makes it over” through painting classrooms and hallways, decorating bulletin boards, planting gardens, and so much more. My assigned task for that day was bulletin boards in a new teacher’s classroom, and I was lucky enough to get to meet the teacher after she saw her bulletin boards. In Orlando, Florida the NEA-SP day of service was called the “Legacy Project.” This was a little fair for students in a summer program in Orlando. There were so many different options of things for the students to do. They could read books, build a toolbox, dance, and learn about healthy choices. I was able to lead a group who talked about the importance of drinking water. It was so much fun and very rewarding! 5. NJEA Convention – In my opinion, NJEA Convention time should be called Teacher Christmas. I LOVE Convention so much! Being able to attend the Convention, as a pre-service educator, is one of the coolest opportunities that NJSEA offers. Not only do I get to attend workshops about any and all educational topics, but I get to meet so many inspiring full-time and pre-service members from all over the state, and hear about what they are doing and what is happening in education all over New Jersey. I joined NJSEA my freshman year so I could attend the Convention, so it holds a very special place in my heart. 6. Benefits of Being an NJSEA Member – I don’t know about you, but I love finding a deal. As an NJSEA member, you get this little card that I am pretty sure has magic powers. So many stores offer discounts to NJEA members and it saves me so much money! A.C. Moore, Michael’s, and Jo Ann’s Fabric offer teacher discounts, and as an avid crafter, I think have saved more than the amount of dues I have paid. Another huge NJSEA benefit is the liability insurance. Basically, if anything happens while you are in the field and you need legal help, NJEA has your back for up to 1 million dollars’ worth. As a typical broke college kid, I am so thankful that I can find deals to help me save money on the little things I need while I am studying to become an educator! 7. My NJSEA Family – Being part of NJSEA has provided me with so much, as you can see above. One of the greatest things I have been given through NJSEA is a support system. I have met so many of my friends through my involvement of NJSEA. NJSEA is an organization that connects pre-service educators, and gives members a common love to bond over. I am so thankful to have my NJSEA family – they are my support system when I am struggling, my comic relief during stressful times, and getting to see the wonderful people I have met through NJSEA always makes my day so much brighter. Being a part of NJSEA has changed my college career, and I cannot imagine life without it, so saying I am thankful for it is an understatement, but thank you, NJSEA, for everything.